Nearly two years ago (next week in fact), I wrote a blog post about First Date Anxiety. The time has come for my follow-up post: Second Date Anxiety. It took so long because it’s been two years since someone asked me on a second date. Ok, I lie. I have been asked on several second dates in the past few weeks alone and I’ve been freaking out about it and turned some of them down (don’t kill me, mother), and figured the only way to face it was to blog about it. So let’s get some background information. I still get first date anxiety, but it’s not nearly as bad as it used to be. I’m still not super comfortable chatting with my friends about upcoming dates, but I’m much better about not throwing things at the wall before he shows up at the door. Now, a second date? Intensified experience. that I should never take one again. I once took a selfie…of myself…after I cut bangs. 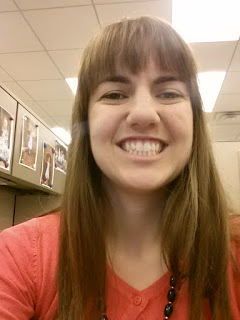 Oh yeah, I cut bangs! (well, technically Chelsea at 27th Street Salon did, but…semantics). Wrote an email to an ex-boyfriend’s mom after we’d broken up, telling her I wished we had met (he still doesn’t know this, but he might if he reads this blog, bwhahahahah). 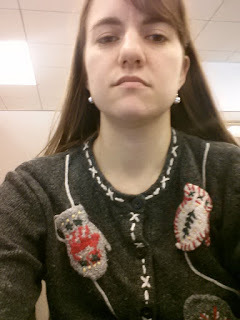 Started a tradition of wearing ugly Christmas sweaters in December for about the past 18 or so years. Jumped off a 3 foot waterfall into a gently flowing river. Competed in a social dance competition in college and took 453rd place. You get the picture. I’m pretty amazing. So I shouldn’t really be all that worried about second dates when I have a great track record for amazing things. Second dates mean something. Don’t try to tell me they don’t because I’m on to you. They definitely do. But here’s the kicker. We don’t know WHAT they mean. It could be that the guy didn’t realize I let him talk the whole time during the first date so that’s why he didn’t discover that I’m a crazy-face. It could be that the guy heard I write blogs about dating and he was curious enough to see if he could get into one (pretty sure this is why one guy wanted to ask me out again since he sent his counter-blog-post to me). It could be that the guy couldn’t get a good pulse on me because we only met up for an hour (my preference for most blind/online dates) and, again, he spent most of the time talking. Or it could be that he thinks I’m interesting and wants to get to know me better. YIKES. I can’t handle that. I don’t even want to spend time alone with me most of the time, what’s this loony-bin boy got in his brain that HE wants to spend more time with me?!? So that’s fine. I get it. BUT ARE YOU SURE HE ISN’T ALREADY THINKING HE WANTS TO MARRY ME? BECAUSE I’M NOT SURE I’M READY FOR THAT YET. Yeah, pretty sure. That’s jumping the gun a leeeetle bit there. Right, right. Of course it’s not because he’s already thinking marriage. Girls would never do that, so clearly guys would never do that. And let’s not even get into the guilt of dating (another post, another day; it’s the worst). But let’s do get into it for a second. If I didn’t particularly feel like a guy and I had much to talk about or I didn’t feel a particular interest, I don’t feel like going on a second date. I feel like it’s fraudulent behavior, worthy of the guillotine. I mean, he’s spending his money and his time on me. So I should make sure that it’s worth it to both of us. And what if I do go? Does he then think that I like him? Do I even know if I do or not? Then what? It’s just a date, Liz. They say. Give him a chance. They say. This is why you’re not married. They say. Bah humbug. Who said second dates lead to marriage anyway? Didn’t you just tell me he was NOT thinking about marriage so I could calm the heck down? And besides, I have set up plenty of these guys I wouldn’t go out with again on dates with my friends. So I’m contributing to the good of society by building my network so I can set more people up. But, to help you feel better, I’ve started researching Second Date Anxiety and reading lots of good articles about how it’s not really a big deal. Like How to Ace Your Second Date and Surviving the Second Date. And someday I want them to pay me for affiliate marketing by the traffic that I drive to their websites, but that’s beside the point. The real truth of the matter is that nothing really helps. It’s all still a mystery and the older I get, it seems the more anxiety I feel in the matter, rather than the hoped-for reverse. When you’ve gone on hundreds of dates (or at least one hundred), it’s exhausting to keep giving chances when you feel you do a pretty good job at first-date judgment calls. And it’s exhausting to invest in people who could smash your heart with a tennis racket (Do I even have a heart anymore?) And it’s exhausting to keep justifying to others why you don’t want to go out again with the person they set you up with. 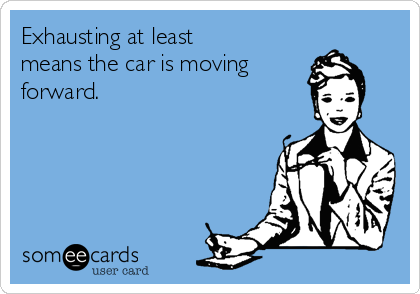 But as the old Chinese proverb says, “Exhausting at least means the car is moving forward.” (I just made that up). So I still carry on, carry on, carry on. Is there hope for me? Perhaps. But let’s just be honest about a few things. I’ve actually taken several selfies in my life, not just the previously mentioned one. Another one was in one of my lovely Christmas sweaters. I’m obviously too much for a guy to trust on a second date anyway when I hide these kinds of things. (Are those jingle bell earrings I’m wearing? Yes, yes they are). You're adorable and incredibly accomplished. Best wishes for your second dates. I also feel like the other person does most of the talking in a lot of my social interactions, and I wonder why the other person doesn't seem to notice. Also, that Middlemarch quote in your about me section makes me excited to finish the book, which I listen to while I run. But I don't run very much. So. I love love your blog! Probably shouldn't read at work, because my students were wondering why I was constantly chuckling. I think they got self-conscious. Well…yes, yes we are. That's the worst part about it. Thanks! I think maybe it's because we're journalists…we ask a lot of questions and write down the answers in our heads and compose a story of the person's life while we listen. Creepy, but effective. And as for Middlemarch, it's kind of a slow read because of its complex plot, but it's really thought-provoking. OK, yes to that. I have to be careful or casual interactions can totally turn into interviews. Also, Liz: You are great and I like you.